"Woodland Park" was one of Florida's early tourist attractions. Was a massive swimming pool crafted from a "tabby" using midden shells, and fueled by a freshwater spring. Have described this in writing before, but think the "unknown" quality of the place in the woods/swamp west of Sanford has far more potential for story-telling. The panel takes questions following the screening of our short film about the great Florida scientist and writer Archie Carr. The well-attended event was held at the Matheson History Museum in Gainesville in late June. That's my own self to the right, with Archie Carr's son, Chuck Carr. "Preserving the Legacy of Marjorie & Archie Carr"
Bill recently receives the "Artist of the Year" award from the Seminole County Cultural Arts Council and the County Commission. Here, Bill---with proclamation in hand----is flanked by county officials after recently receiving the award. AM HAPPY TO REPORT THAT MY LATEST BOOK ("PEACE OF BLUE") WON THE SILVER MEDAL IN NON-FICTION in the annual competition by the prestigious Florida Books Awards. THE ST. JOHNS AS IT DILATES into Lake Monroe at Sanford during a recent sunset. CLICK HERE for the podcast of my recent interview on the national American Variety Radio program by host Court Lewis. A series of stories in the genre of creative non-fiction, all having to do in some way with water---around it, above it, below it, and so on. THANKS to ARTIST Jim Draper for the use of the beautiful image "Fern Spring" for the cover. Click here for the University Press of Florida's link with more info on my new book "The Peace of Blue". The link contains comments from other authors about the book, as well as actual excerpts from it. NEED A SPEAKER WHO CARES ABOUT NATURE AND SENSE OF PLACE ? Bill could be your ticket ! He's spoken widely around Florida for colleges and universities, the Florida Humanities Council, and assorted writers associations. Bill uses a PowerPoint with some captivating images taken from nature. Understanding how this wild nature shapes culture---and sense of place---is key to understanding our place in the world. For more info, give him a holler at billybx@​gate.net. Former Fla. Gov. & U.S. Sen. BOB GRAHAM is filmed at the edge of Silver Springs in mid-Feb. in preparation for our forthcoming PBS film on springs our non-profit Equinox Documentaries is producing. Entitled "HIDDEN SECRETS OF FLORIDA SPRINGS" it will reveal the scientific "secrets" of hidden fossils and labyrinthic passageways---but will emphasize the more dangerous "secret" in which most of our springs are dying a slow death by loss of flow & increase in nitrates. This last one is a "secret" we can reverse---as long as we build a consensus among citizens to make it happen. To see a short "trailer" for it, click on the live link ("View our New Springs Trailer") in the column below. 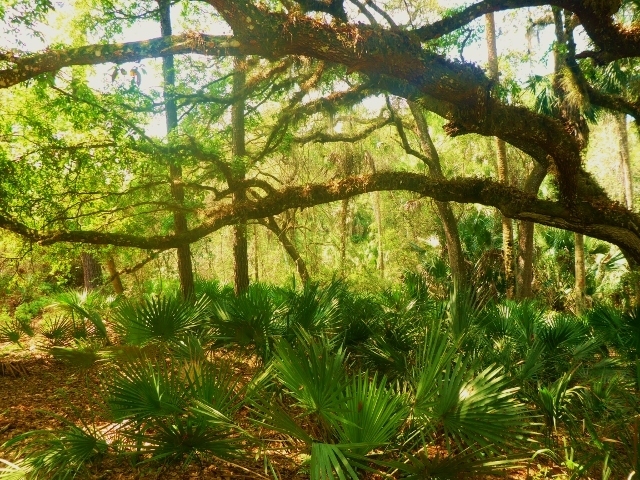 This is Fern Hammock Springs, which feeds into Juniper springs in the Ocala National Forest. This is the spring that inspired Jacksonville artist Jim Draper to paint the image "Fern Spring", which is used for the cover of "Peace of Blue"
The cover of "River of Lakes" shows me in a kayak just after dawn along the middle St. Johns River. News article about two new springs we were able to discover and to map with a state GIS specialist a few weeks ago in the wilderness of the swamps within the 110 square miles of public land in the Wekiva River basin. A journey devoted to inter-disciplinary studies with an extended essay I was asked to write that deconstructs the making of our Equinox PBS film "In Marjorie's Wake"
Listen to an on-air interview on the "Tropical Currents" program in which Bill discusses his book "Salvaging the Real Florida"
"SALVAGING THE REAL FLORIDA: LOST & FOUND IN THE STATE OF DREAMS". * In this collection of narrative essays, nature writer Belleville explores the swamps and jungles of Florida, investigates a shipwreck and a historical riverboat town, and searches for native wildlife such as the black bear and the cave-dwelling shrimp. The point of Belleville’s writings is that getting outside is the point. You get scratched up and sunburned. You have muck on the outside of your shoes and sand on the inside. • "Get off the interstate, cast a cold eye on the strip mall, eschew the theme park, and come with Bill Belleville to the green heart of the real Florida. He takes you to the secret places in the deep woods, the holy swamps, the springs as blue as a sapphire and as cold as a January midnight." - Writer & NPR Commentator Diane Roberts, author of "Dream State"
MP3 recording of an interview on "American Variety" radio program about "Salvaging"
Op-Ed Essay that champions Florida's natural places, and explains why diluting laws to protect them in the name of "economic prosperity" is reactionary and generally mindless : "Nature Didn't Burst the Bubble"
This is a shot I took of Bob Giguere, my partner in our non-profit film group, Equinox Documentaries, videotaping in the deep lagoon outside of Wekiwa Springs a few days ago. We were putting finishing touches on a short film on turtles & ecology--and, if lucky, we might even work a bit o' culture & myth into the story. "AQUIFERious" won the top honor for non-fiction books published in Florida in 2010 ! The stunning collection of images of our springs by artist Margaret Ross Tolbert is a compelling blend of art, science, adventure and literature. Sure am proud to be a contributor with an introductory essay that was a literary and cultural riff on our spring system here. www.Aquiferious.com. Gar schooling in the run of Blue Spring seem only too happy to oblige when I shot this one..
A native passion flower in bloom, as seen in my backyard. Bartram sketched one of these during his excursions into Florida. * BARTRAM'S LIVING LEGACY: THE TRAVELS & the NATURE OF THE SOUTH - Anthology that both reprints the original "Travels" (1791) as well as presents a number of essays from Southern nature writers about the natural places they love---places once visited by the naturalist in the 18th century. Exquisite landscape art created especially for the book by Philip Juras. Edited by Dorinda Dallmeyer. Mercer University Press. In my 5,000 word piece, my hiking bud Steve and I venture into a swamp that's on the cusp of a tributary of the St. Johns. * "UNSPOILED: Writers Speak For Florida's Coast": Contributors to this anthology argue against drilling in the Gulf of Mexico for a variety of very good reasons---some scientific, some more sublime. Writers include Connie May Fowler, Jeff Klinkenberg, Diane Roberts, Janisse Ray, Jan DeBlieu, Jack Rudloe, Susan Cerulean, Dawn Radford, myself, et. al.. Ironically, the essays were written and the book went to press BEFORE the BP disaster. This is both timely and very sad. Noted nature writer Terry Tempest Williams has described "UnspOILed" as one of her favorite five books for the year. "...Each of these essays from memoir to environmental history creates a strong argument for a deeper sense of place..."
Bob Giguere, volunteer Julie Fisher, and myself at our Equinox exhibit during the Friends of the Wekiva's annual Wekiva Riverfest. For more on the good work this non-profit does, click on the live link describing the FOWR lower in this column. NOVA is one of over 35 springs that feed the complex Wekiva River system. GIVING a presentation at UF's School of Law in Gainesville, Fla. on "Sprawl"
COLORIZED postcard "On the Beautiful St. Johns" from the new book "Florida's American Heritage River: Images From the St. Johns Region". I wrote the Introduction & served as consultant for the project. HISTORIAN Jim Robison (r) and myself discussing something obscure in prep for a talk on "Along the Wekiva." A chronicle of researching and filming our new PBS film produced by Equinox Documentaries. More info & to buy "Rediscovering Rawlings"
Paddling on Rock Springs Run during a Friends/Wekiva River outing. An early archival photo of the headspring of the Wekiva River, which figures large in "Losing it All to Sprawl." 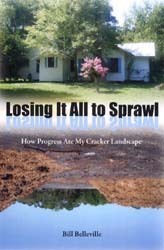 Of this book, authors have written:"[It] is about one man's small piece of a vanishing paradise, yet it's really about all of us who cherish Florida and fear for its future. Bill Belleville writes gorgeously and straight from the heart. This is a compelling and insightful book and it's impossible to read it without feeling sadness, outrage and awe." - Carl Hiaasen. "Bill Belleville writes about the old Florida, the real Florida, like a poet or maybe a preacherman---certainly a prophet. He's up there with Marjorie Stoneman Douglas and William Bartram." - Diane Roberts, author of "Dream State." Musician and teacher Jennifer Chase joined writer and educator Leslie Poole on the river journey in our documentary film "In Marjorie's Wake." The film, which retraces the real life excursion of Marjorie Kinnan Rawlings on the St. Johns, also examines the inextricable ways in which the landscape can shape culture. For more on the making of the film, click on the link to Equinox Documentaries blog towards the bottom of this column. Jen also wrote ten songs about the literary-river experience, and they are available on a CD via the Equinox link. SHEP June 1993-May 2007 I've written about Shep in books and essays. He was always there; watching, playing, having fun. He was just the sweestest and smartest dog. And he was up for most anything. We had great times, sometimes just us, sometimes with others, poking around on the trails. Thanks to folks, past and present, who cared for him, and to those very special people who always will. "Rediscovering Rawlings, a River and Time"
Equinox Documentaries, our not-for-profit film group devoted to making films about nature and "sense of place"
VIEW OUR NEW SPRINGS FILM TRAILER HERE ! Take a gander at our newly-produced nine-minute video "trailer" that visually explains our forthcoming PBS film "The Hidden Secrets of Florida Springs". (A photo of former Gov. Bob Graham being filmed for the trailer can be found in the column on the left along with more info on the content.) Click on the headline above to take you to the YouTube link where the film can be seen and heard. WATCH THE "PORTAL INTO THE TIMELESS WISDOM OF ARCHIE CARR", OUR NEW 18-MINUTE FILM WE PRODUCED THAT CELEBRATES THE WAY IN WHICH FAMED NATURALIST ARCHIE CARR used the Ocala National Forest to teach his UF grad students the interwoven values of ecology. This film will be screened at the upcoming Global Peace Film Festival in Winter Park on Oct. 9 and Oct. 10. Click on the link for the Festival at the top of this column for more info. Questions? Click here to give me a holler. FRIENDS OF THE WEKIVA IS our region's premier grassroots river conservation group. I've been on their board for over a decade and worked on many projects with them. ALLIGATOR PRINCESS: Learn about an exciting new film that documents a solo paddle one woman made on the St. Johns River. A multi-media project that celebrates NATURE WRITING in the Southeast. Lots of critters depend on protected habitats like this for food and water and shelter---from black bears to rare wading birds---just as they have for thousands of years. The 32 square mile Forest is part of the surrounding Wekiva River basin---which is home to some of the greatest biological diversity of plants and animals in all of Florida. These wild places are among my favorite places to go and, if I'm lucky, to participate in the dialogue between wilderness and the human spirit. Fortunately, a dialogue like can still be found in Florida wherever our intact ecological systems still endure---the coastal lagoons, the un-roaded Keys, the offshore reefs---any real place where the sweet and noble force of nature has the energy to sing its hymn of comfort and light. Our forthcoming PBS film for Equinox Documentaries has to do with our Florida springs and how they've shaped our landscape---and our culture---through time. For more about it, click on the link under "View Our New Springs Film Trailer" at the column on the left. I MAKE MY LIVING as a nonfiction writer specializing in nature and conservation. I've authored six books, contributed to eight national anthologies, written over 1,000 articles & essays, scripted and co-produced seven films. On assignment, I've traveled to Australia, the White Sea of Russia, the Galapagos, Central and South America, Cuba and throughout the Antilles. Florida, where I live, remains my favorite place for its natural diversity and wonderful surreality. REVIEWS for books & assorted projects follow here in the middle. Excerpts from books can be found under "My Works", while the "Biography" link, oddly enough, is actually a sort of a biography. News of upcoming lectures and events are in the column to the left. I have written seven books, contributed to nine national anthologies, and authored over 1,000 essays and articles for magazines and journals. Our PBS documentary, "In Marjorie's Wake: Rediscovering Rawlings, a River & Time" earlier completed a two-year national run with broadcast play in major markets, including New York, San Francisco, Chicago, Boston, MIami, and many more. And our short film on the "Carr Family Cabin in the Florida Scrub" will soon be augmented with study guides and other curriculum to help students and other visitors to the cabin site in the Ocala National Forest more fully appreciate the dedication to nature and science the Carrs engendered. AM ALSO HELPING TO script and co-produce a film about one woman's solo paddling journey on 500 miles of the St. Johns--"Alligator Princess of America's Nile"--- via our non-profit Equinox Documentaries, Inc.
MORE RECENT NEWS on public behaviors can be found in the column to the left of this page, including LIVE LINKS TO WEBSITES relevant to my work. More info about my latest book "The Peace of Blue: Water Journeys" can be found there as well. Learn more about "From Eden to Sahara." In 1929, botanist John Kunkel Small wrote a prophetic book about the impacts of development on the Florida landscape. Small, who had been collecting plants for the New York Botanical Garden for almost three decades here, was alarmed at how drainage and channelization were destroying the rare Florida that he loved. Without its vital wetlands, springs and rivers, the peninsula would eventually turn into a desert if trends continued, Small warned. Plans are now underway to use this book as way of explaining Florida's precarious water situation in a new Equinox Documentary. This is the cover of "Sunken Cities," my anthology released in May 2004. To learn more about it, and maybe order it from Amazon, click this link. BOOK REVIEWS & BLURBS about "SUNKEN CITIES"
"Just about the time that you, dear reader, are pulling out of your driveway, heading for your daily aggression-filled hour on the expressway or inbound commuter train, Bill Belleville is probably tumbling backward off the gunwale of a diving boat into a crystal-blue ocean. An environmental journalist and filmmaker, Belleville has managed to make a decent living, as far as one can figure from these enjoyable essays, out of visiting ecologically engaging underwater sites in the West Indies and in Central and South America, and then writing about it for the folks at home. Nice work if you can get it. It’s not all dog-paddling in a heated pool, though. Belleville is an expert diver whose wanderlust takes him to places few sane people would venture. In one early scene in the book he is dangling in a harness fifty feet above the water level of an overgrown limestone cenote, or sinkhole, deep in the jungle of the Dominican Republic. From that precarious position, a winch will lower him down to an inflatable raft floating on the shadowed waters far below. With a team of scuba-clad archaeologists, he will dive more than a hundred feet farther down into the cenote, to a pinnacle of rock that rises from the pit’s bottom (some 250 feet under water). From there, he and the rest of the team will get their bearings as they search for artifacts tossed into the sinkhole by pre-Columbian tribes as a sacrifice to their gods. It’s cold, dark, and claustrophobic down there, with practically no margin for carelessness. But the journey, which leads to the discovery of shards of ancient pottery and the bones of extinct sloths, makes for a story of great suspense. Equally chilling is Belleville’s account of a nocturnal dive off the coast of Cuba in search of the rarely seen, bioluminescent flashlight fish (Kryptophanaron alfredi). To spot its soft radiance, Belleville and a companion turn off their lamps before descending into near total darkness, aiming for an underwater cliff top. They can see neither their depth gauges, the research vessel above them, nor even one another. Except for the increasing crush of water pressure, the luminous flashes of the passing marine life, and the glow of their own ascending air bubbles (which roil the abundant plankton in the water), the effect is one of almost total sensory deprivation. When Belleville finally pulls up, turns on his light, and looks at his digital wrist gauge, he finds that he’s dropped almost 110 feet, probably overshooting the target. For a tense ten minutes Belleville wanders around alone searching for his partner, whose light, if it’s on, is nowhere in sight. He’s afraid to swim very far in any one direction, terrified that, should he be forced to surface too far from the boat, he’ll be lost from sight, a helpless dot in the choppy waters that surround Cuba. Fortunately for Belleville (and for readers with a low tolerance for stress), most of the brief excursions he describes in his book take place in far less threatening, though no less interesting, settings. Short essays describe travels to the interior of central Guyana, where rugged jungle and towering waterfalls become exotic destinations for ecotourism; to the ominously named Mosquito Coast of Nicaragua, where conservationists try to enlist native fishermen in a project to preserve endangered sea turtles; and to the Peruvian Amazon, where a team of biologists is studying the behavior of the boto, an unusual, pink, freshwater dolphin. Belleville’s account of the commercial conch farm he visits on one of the Turks and Caicos Islands, an archipelago southeast of the Bahamas, depicts an operation not unlike that of a Midwest cattle ranch—though the conchs, which look like foot-long garden slugs, are destined for soup pots around the Caribbean, not fast-food joints in Tulsa. Yet such is Belleville’s talent that even when he ventures into relatively familiar territory, he brings an unfamiliar perspective, finding adventure and wonderment in little-seen corners of the natural world. In one episode he describes cave-diving on the Suwannee River in northern Florida, and rejoices in "the singular wonder of being inside the living veins of the earth." In another, he and a college friend take a canoe trip into the heart of the Everglades. There, only a few dozen miles from the strip malls and beachfront condos where former commuters go to live out their days, are worlds out of time: transparent channels filled with needlefish, lone ospreys gliding past tangled mangrove shores, flocks of sulfur-winged butterflies." ""This collection of essays brings the reader to places that are noted for archaeological treasures, rare plants and animals, or great scenery, and water is the common denominator. Belleville, travel writer, scuba diver, and boater, seems always to be wet or preparing to be wet. As his armchair companions, readers may stay dry, but the expressive and descriptive prose allows them to experience the discovery and excitement as if they were there themselves. In the Amazon, the quest is for a freshwater dolphin. In the Florida Keys, it's the quiet backwaters that preserve the past, and so on, around the globe. Belleville is an old-fashioned adventurer, excited by what he finds, seeking just for the joy of finding. He must also be a man of great charm as he seems able to coax the most arcane information from his local guides...As a book to read at leisure, it is a fine treat." "Florida-based naturalist Bill Belleville journeys to one of the last travel frontiers: the underwater world. From the Gulf of Mexico to the Amazon, Belleville seeks out strange aquatic species and sunken archaeological sites. He witnesses the rare spawning of a coral reef. He introduces the freshwater pink dolphin, which Peruvian villagers believe to have magic powers. And he explores the underwater ruins of Port Royal, Jamaica, the "Pompeii of the Caribbean," swallowed by the sea during a 1691 earthquake. These tales of adventure were originally published as magazine pieces and are crisply written in the you-are-there present tense. Belleville's writing is down to earth, with minimal jargon (one exception--he never defines precisely what a cenote is). He enlivens his prose with flashes of humor and indulges us urbanites with pop-culture analogies. Water is not the only common theme flowing through these pieces. So is a love for unspoiled nature and an impatience with those who threaten it. Belleville has crafted each story to foster appreciation for the natural world. "I admire the precision, the poignancy and the passion of Bill Belleville's prose." "What splendid adventures Bill Belleville guides us through! He is one of our great modern explorers, questing for gods in a time of technology, lusting for life. Here in this sensuous and unforgettable book he navigates us as deftly through language as he does Amazonian rivers or limestone fountains deep within the earth. His journey narratives are fluid, fresh, and piercingly poetic; what he finds is ceaselessly fascinating. I would travel with Bill Belleville to the ends of the earth." -Janisse Ray, author of 'Wild Card Quilt: Taking a Chance on Home' & 'Ecology of a Cracker Childhood'. "Bill Belleville's writing is like a stream of phosphorescence in the ocean that he loves so well. Belleville's language creates a dreamy double vision, blending archetype and precision so well that the reader is convinced he has not merely read about jeweled morays and pink dolphins, but floated alongside them in tropical waters. These tales are not hairy-chested, macho attempts to conquer snowcapped peaks, but adventures into sensuality and meaning." "With the release of a new book, 'Sunken Cities,Sacred Cenotes and "Golden Sharks: Travels of a Water-Bound Adventurer,' Florida author Belleville is that much closer to solidifying his reputation as a top-shelf nature writer. As much adventure story as naturalistic poetry, Belleville's latest excels at wrapping his eco-prose in a captivating form. After all, who doesn't love reading about sunken treasure? For Belleville, these treasures are both artifacts and living; he gives as much breathless attention to coral reproduction as he does to a now-underwater city. As with "Deep Cuba" (Belleville's last book, recently reissued in paperback), "Sunken Cities" is a book that tackles ecological and political problems in a way that's engaging simply as a stand-alone story." "Bill Belleville is a fearless Florida scuba diver, explorer and underwater adventurer. He also is a heck of a writer. His poetic images in his latest travel tale, "Sunken Cities, Sacred Cenotes & Golden Sharks," not only engage the reader but elevate his work to a higher level than just another trek through the jungle. Each of these chapters -- already run in magazines, which accounts for their brevity -- could be a book unto itself, but Belleville seems content to recall the moments leading up to each memorable dive, the dive and then the spiritual or philosophical rush he gets from the dive. He meets a lot of interesting characters, as one would in the swampy backwoods of Florida or on the remote islands and rivers of the Caribbean Basin." The information superhighway can be a busy, congested place, and we're all trying to navigate it without becoming roadkill. One of the best ways to navigate anything, I've found, is to simply slow down. I feel there's a lot of wrong turns made by going way too fast, by wanting to be somewhere else other than where we are at the moment. The natural world helps me slow down. It's a bit like fly tying---the behavior itself affords a certain grace. It just doesn't allow us to rush through it. That's one of the reasons I've chosen to write about experiences that take place under the sky, on the water, deep in the woods somewhere. Learning about habitats and ecology---of people and place---is an abiding theme. But, really, it gives me the chance to spend a lot of time playing outside. Like naturalist Aldo Leopold, I don't think we can really connect or care for a place unless we have a gut relationship with it. We're losing our natural lands at an alarming rate---especially in Florida where I live. Citizens who years ago might not have wanted to rock the boat now feel a need to speak up and express their concern over this loss. Maybe my books, articles and films might suggest how urgent it is to forge a connection with these places. But, anything I can say in way of advocacy is only rhetoric; it pales next to a personal experience a reader or viewer may have with a natural landscape. Jim Harrison has written that the danger of civilization is that "We piss away our lives on nonsense." Web sites, books, films---they can only do so much. They are tools, honestly, ways to lead us to authentic and real places in the world. But if we obsess on them, they lose their context. And, it's a conceit to think that only writers or artists have an exclusive grasp on blazing trails to these places. Celebrity can be very seductive, both for the one being celebrated as well as for the ones engaging in the celebration. We can help read the maps and use the compass. But, the experience of finding your way to a rare place that affords redemption is yours alone. So, after you make your way through this site---or maybe sometime before--- turn off your computer, go outside, and breathe deeply. Take a walk in the woods. Snorkel or scuba dive in a spring, a lake or river, an ocean. Paddle your canoe or kayak until you can no longer hear the hum of the mechanized world. Travel to a distant rainforest or reef and get to know the people whose lives are shaped by the wonder of it all. Or just sit under a tree and relax. Let our genetic predisposition for the natural world kick in. You don't need me or anyone else to preach to you about protection or preservation. You'll know what to do.